When it comes to relaxing after a hard day, nothing beats doing so on one of the best hanging swing chairs for kids. This trendy chair will be the perfect addition to your patio or your garden. The fact is that swing chairs have always been fashionable, but it seems that these chairs come with extra health benefits as well. For example, if you have a hyper-active child, then the swing chair can help to calm him down and get him to focus better. What makes these kids hanging swing chairs, or the perfect home furniture is that they are versatile and multi-functional. You can set one up in the front garden or front patio for your kids to use for some playtime or relaxation. Swing chairs are multi-functional; you can easily set them up, by suspending them from the ceiling or from the branches of a sturdy tree in the garden. These chairs can help you relax after a long, hard day and even provide your kids with fun and entertainment. Or you can use these chairs as a decorative item as well or something to sit on when gazing at the stars with your handy telescope. And the chairs come with attractive price tags, but if you are still not sure about which chair to purchase, do check out some of the best hammocks for kids, posted below. Choosing the right child pod swing chair can be hard, given the sheer variety of choices out there. There are various factors that you may want to consider, its ease of set up, and whether it comes with any benefits. You may also want to consider what it’s made from as well as check out some of its reviews. This child pod swing chair certainly outclasses most of the other best hanging chairs for kids with a flawless and comfortable design. More importantly, this swing chair is safe to use and comes with a great durable design. It also features a comfortable cushion for padding and with its slow, swinging movements, it certainly stands out as a great sensory swing. What’s more, it can help your kid relax and concentrate better, especially if he is autistic. It comes in a neat little package with all the required hardware accessories that you would need to set it all up – carabiner, adjustable strap, air pump, screws and ceiling hook. You can use the step by step directions and get the child pod swing chair set up in a short time. It is multifunctional and can be used as a sensory swing as well as a therapeutic swing for autistic kids. This indoor swing chair for toddlers is perfect for kids, three years and older. It can withstand 175lbs easily and comes in three types, cotton, classic cotton and organic. The indoor swing chair for toddlers consists of high-grade quality cotton and does not contain anything toxic. And as for the design, it is perfect, one that can help to cocoon your kid comfortably. What’s more, the gentle movements on this chair helps to relax and calm down frayed nerves, which makes them perfect for kids with special needs or who happen to be autistic. Moreover, this indoor swing chair for toddlers is recommended by the German Federal association. It happens to be incredibly strong. This product certainly tops the list when it comes to the best hanging swing chair for kids. It consists of durable, high-quality cotton and is soft and luxurious to touch. It comes with comfortable seating. This kids’ hammock chair comes with a neat little design and one that’s quite durable as well. This stylish swing chair comes with interesting color choices and can be easily set up either indoors or outdoors. This seat hammock nest can withstand heavy weights and can be easily set up. It is also perfect for play time; the fact that it also comes with a comfortable seat makes it easier to sit the small kids in the hammock. The kids’ hammock chair also comes with the required mounting accessories that you need to set this chair in place. Just follow the detailed directions provided and you should be able to set up this chair in no time at all. This kids’ hammock chair comes with an innovative design that makes it perfect for both fun and relaxation. You can hang this swing chair either on your patio or in the garden so that you can relax and unwind after a hard day’s work. The design is unique, and it should certainly look great in your garden. It can withstand up to 265lbs and is perfect for both kids and adults alike. The chair itself suspends from ropes, a wooden bar as well to provide stability. Furthermore, it also comes with the required support in the form of a plush seat and back cushions. It is currently available in a few shades, including blue as well as red, so you can opt for the one in your preferred shade. This child pod swing chair soon makes it apparent why it happens to be quite popular among kids. For starters, it comes with a comfortable design, complete with a closed suspension that will safely ensconce your kid. Your kids will feel safe and comfortable when using this particular chair. The chair’s slow movements will help your kid relax better and aid in his development as well. It is perfect for ages 2-9 years old, and as it cocoons the kid, it stimulates proprioception into the child. This child pod swing chair consists of high-grade quality content, as well as an inflatable cushion for more comfort. Measurement: hammock measures 27.6x 59.1 x 27.6 inches with seat diameter 27.6 " and Weight 2.42 pounds. Perfect for children age 2-9 years. It comes with various accessories such as 1pc Cloth case, 1pc inflatable cushion, 1pc metal ring, 1pc expansion screw, 1pc rotary joint, and 1pc adjustable connection rope. 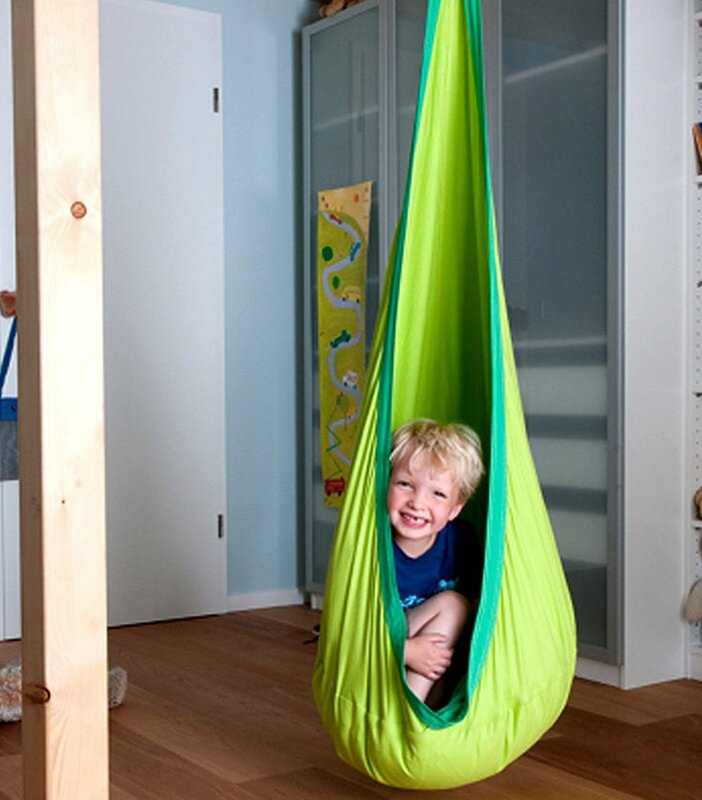 This indoor hammock chair stands out as one of the best hanging swing chairs for kids. Incidentally, this Macramé chair can withstand 265bs and is perfect for both kids and adults alike. This swing chair is multifunctional; you can use it as a hammock or a swing chair. You can also use it as a cradle to help your kid fall asleep. It is designed for comfortable and leisure use and can be easily set up in any corner of your home. All you require is a study overhang and that’s it. You can also hang this chair/ indoor hammock chair in your garden, and indulge in some star gazing. The chair itself consists of high-grade cotton and you can hand wash to keep it clean. Styish, and comes attractively priced. This kids’ hanging chair for outdoors is quite impressive with its kid friendly design. Your kids can use this swing chair for play time, to snuggle with their friends, or to read and listen to music. It consists of 100% nylon and is perfect for outdoors. It stands out from the rest as it is cozy, comfortable and easily supports more than 1 kid at the same time. With the LED string lights, you should be able to use this swing chair even late at night. This kids’ hanging chair comes with an attractive price tag as well. This hanging pod chair for bedroom comes with an attractive and comfortable design. It is generally designed for kids 3-9 years old and can easily support up to 176 lbs. You can easily set it up in your kid’s bedroom and he can use it a play area and even snuggle in during those cold wintery days. It is important that you take care when you affix this hanging pod chair for the bedroom. The chair itself comes with all the accessories you need, to affix it firmly from the ceiling or any sturdy overhang. The materials may expand over time and use so try to take that into account when setting it up. It is designed mainly for kids, 3-9 years old and can support 176 lbs. It consists of a cotton mat, canvas, rope, inflatable air cushion etc. The Ikea hanging chair certainly comes with an interesting design and one where you can fold and easily transport it from one area to another. The Ikea hanging chair comes in several color combinations so you can take your pick. More importantly, you can set it up in any part of your home, from the bedroom to the front patio. The padded cushion only serves to underscore the fact that this chair is both luxuriant and comfortable. This swing also aids in kids’ development especially in relation to balance and body perception. Package contents: 1pc Cloth case+ 1pc inflatable cushion+ 2pc hook+ 1pc Inflator Pump. It can be mounted against walls, suspended from the ceiling and much more. When it comes to the top choices for kids chairs, this kids’ hanging chair DIY certainly ranks among the top ten. This baby cradle hammock is perfect for cradling and soothing infants. It is just what you need on those long trips, where it should come in handy in getting your baby to fall asleep. Nothing lulls a baby to sleep other than a gentle rocking motion and this hanging chair DIY does exactly that. Moreover, this baby cradle is composed of 100% cotton with an iron frame for strength and stability. What makes this cradle stand out is the fact that it comes with a body contoured soft cushion that easily adjusts itself to your baby’s shape and dimensions. It is strong, robust and durable and should definitely last the whole trip. It also comes with a lifetime warranty. And the customer service is quite fast to respond to any queries you may have regarding the product. These are some of the best hanging swing chairs for kids; all these swings/hammocks which you can get for your kids. Check out the description listed against each one and choose the product that appeals the most to you. As far as the price goes it is bound to vary, depending on the product and its functionality. You may want to consider as to why you need the swing/ hammock, the main purpose behind it and get the right one for your home. Please remember to read all the guidelines, and to follow the step by step instructions carefully. Remember that you are setting it up for your kids, so you need to make sure that it is properly setup as per the directions provided. And, in case of any queries, at any stage of the process, you can always contact customer service and they’ll usually respond within hours of sending the query over. Some of these products come with a lifetime warranty when others do not. That’s something else that you may want to consider when reviewing the list.